Don’t Miss Our Perfect Pairings Fall Trunk Show! October 20-22 at Bellagio. Need some fresh inspiration for your fall wardrobe? You’ll find it at our “Perfect Pairings” Fall Trunk Show at Bellagio Art-to-Wear. 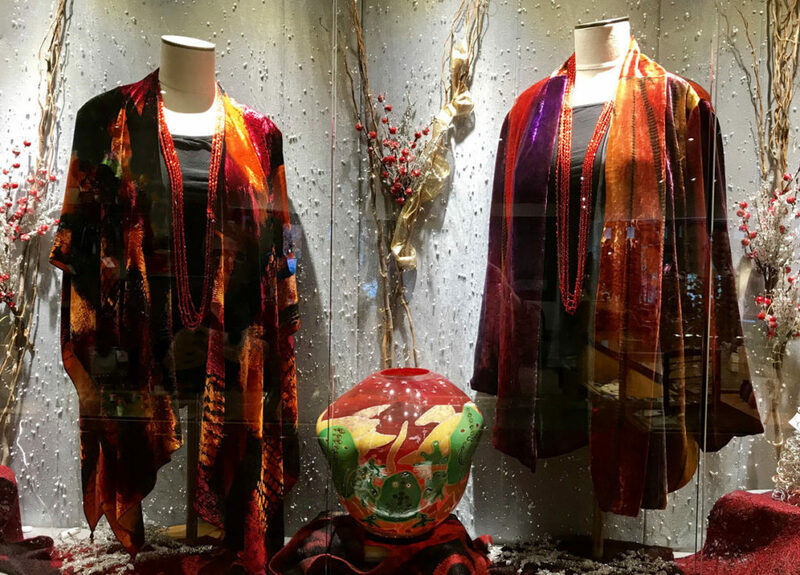 During this weekend of fashion, art and conversation, we’re doubling up on the fabulous with fall collections from two of your Bellagio favorites: jewelry by Terri Logan and clothing by Kay Chapman. For more information, call the store at 828-277-8100 or contact us here. Well see you there! Kay Chapman creates limited edition, hand-painted garments in easy-to-wear silk, linen, cotton and wool. Each piece brilliantly interplays texture, pattern and color for a truly one-of-a-kind, timeless look. Terri Logan combines industrial and organic elements to create exquisite and powerful jewelry that can enhance any outfit. Her hand-cut and mounted beach and river stones, set in complementary metallics are the perfect complement to Kay Chapman’s rich designs.